FREE Microsoft Office for UK university students! If you’re a current university student in the UK, you could well have access to full free desktop versions of Microsoft Office through Office 365. Microsoft says over 99% of UK universities are signed up to the subscription plan so for the length of your studies you can get free access to the entire suite of Microsoft Office suite. Simply click here to go to Microsoft’s site and enter your university email address. Check your email for a confirmation link, and voila free Office! You can use the software on up to 5 PCs and/or Macs and the subscription is valid until your studies end. There are also a certain number of colleges that are signed up for the service, so it’s worth checking with your academic email address. Drop us a comment if you grabbed free Office! This entry was posted in Software, Useful websites and tagged access, download, email, excel, free, mac, microsoft, office, onenote, outlook, pc, publisher, university, word on September 26, 2015 by GEEK!. As you may have noticed, I’ve recently moved GEEK! to a brand new VPS – which, hopefully, will massively improve the uptime and performance of the site in the long run. It’s a little too early to tell, but now most of the trial bugs are ironed out, improvements should start to be seen soon. However, by moving my site (and all other sites I run) to a VPS, I have had to make some sacrifices. The key sacrifice on my end has been cPanel – which I’ve used ever since I started working with web servers. I love cPanel – it’s generally very reliable and controls most of the functions I would ever want. But now, as I’m slowly getting more experienced with the way web servers work, I thought it would be a good time to move on to something a little more advanced (and, as a result, cheaper). I was recommended to ISPConfig – a free and open source control panel for web servers running on Linux. And after a slow start, I seem to be getting the hang of it. The one thing that really did get to me for a while was the poor performance of the spam filter built into ISPConfig. ISPConfig relies on SpamAssassin – which is, when configured correctly, a very powerful spam filter. But for some reason, it just wasn’t working on my installation of ISPConfig. Spam would get through and it can get seriously frustrating! Thankfully I now have it cracked – and wanted to share the configuration I chose for ISPConfig and SpamAssassin. I think the correct settings vary from person to person – but if you want general spam filtering, this should show you how to get it. This entry was posted in Guides, Quick fixes and tips, Software and tagged config, configuration, email, filter, ispconfig, junk, setting, spamassassin, web on January 23, 2012 by GEEK!. Spotify have just sent me an email which did get me rather overexcited. Check this one out! I really would love to believe that you could buy 100 tracks for £1.15 – I guarantee you it would be a bestseller! 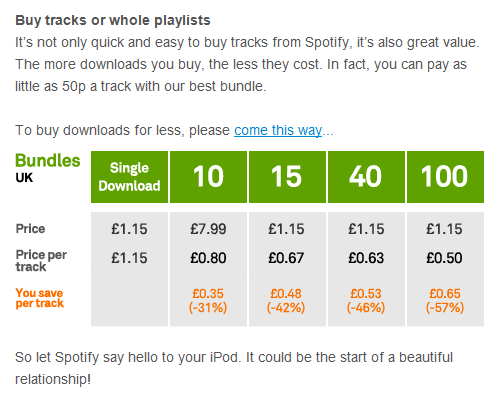 Sadly, when you actually go Spotify’s site, the actual price of the package is £50. Slightly disappointed, I have to admit. On a more general thought though, it does make me think of the amount of poorly written emails we get these days. You’d think, for a company of that size, they’d at least have someone to check over emails before they send them. This entry was posted in Rants, Software and tagged email, music, newsletter, spotify on July 10, 2011 by GEEK!. Yeah right – as if this is legit! Nice try, jerk! It goes without saying, don’t open emails with zipped attachments unless you’re absolutely sure what’s in it and who it is from. Opening this one would have got me a trojan. 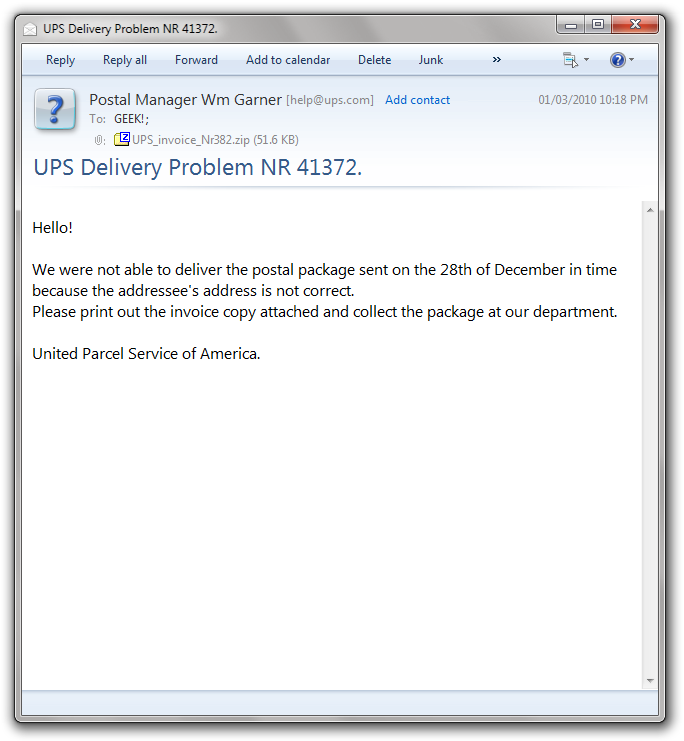 This entry was posted in In the News, Quick fixes and tips and tagged email, fake, ups on March 1, 2010 by GEEK!. Is SPAM one of the most annoying things in life? I think so. Please note the image shown above contains some mature content that may be unsuitable for younger readers. Do you know why it annoys me so much? Because every time I get it in my inbox, it makes me think of the time I waste hitting the now worn-out Delete key on my keyboard. I must spend hours of my life deleting emails telling me about new “life changing pills” and “big savings”. And believe me, that’s the clean side of it. SPAM really depresses me. The fact that there are people out there who like programming computers to use our emails to send us fake emails that are just booby-traps to more SPAM. And, yes, there are plenty of SPAM filters out there that will rid the crud from my inbox, but I still feel terrible seeing my Junk folder fill up with thousands of emails monthly. So yes, if you’re one of the many million or so people who hate SPAM, there’s not a lot we can do. But it does make you think, how much time, energy and money do we waste deleting SPAM? This entry was posted in Rants and tagged email, energy, rubbish, spam, time, waste on July 12, 2009 by GEEK!.